This tincture contains high-quality, medical grade, Organic CBD at 600 MG. per 1 oz. (30ml) bottle. In a recent study, 88% of people reported that CBD improved their overall sense of well-being and relieved anxiety and headaches. Our Rena’s Organic® organic, full spectrum, pharmaceutical grade CBD is of the highest quality, grown in Colorado and 3rd party tested. The plants used for Rena’s Organic CBD are specifically bred using select proprietary genetics to have a higher concentration of Cannabidiol (CBD). Get this multipurpose pure CBD oil 600mg tincture at an affordable price at Rena’s Organic Shop. The Super Critical CO2 extraction process we use, though more labor-intensive, ensures that every bottle is chock-full of the plant’s nutrients, terpenes, cannabinoids, polyphenols, protein and anti-oxidants. It is the synergy of these components that give our high quality CBD the reputation of being a “miracle” pain eraser. Each batch is sent to us with a certificate of analysis insuring potency and purity. Promote fast pain relief from the inside-out (for best results, use with Rena’s Organic® 1000 mg Pain Relief Cream). Just a few drops under your tongue, daily, can turn the clock back and help you to feel younger and more energized. Rena’s Organic® CBD 600 MG. tincture is pure CBD and oil with a drop of orange essential oil, absolutely no chemical “natural flavors” and no fillers. What is the best dosage of CBD to start with? 600 MG. is our medium dose tincture. It’s a great place to start on your CBD journey. So many heavily promoted Hemp products out there don’t even contain 100 MG. authentic CBD, so 600 mg. is a very generous dose. How much CBD you need to help you relieve anxiety, eliminate pain, sleep better, improve your mood, balance your blood sugar and regulate your digestion varies from person to person. I recommend you start with ½ dropper-full (10 mg) 2x per day. Most people report that their optimal dose is 25 MG. twice a day (which would be a little over two droppers per day). Why is this CBD product different from others? I came to see that many marketers out there talk about the miraculous benefits of CBD, but in reality their products are mostly Hemp, and contain little or no actual CBD (Cannibidiol). More than likely this is because true CBD is much more expensive to produce than Hemp, which is a cheap product, readily available. 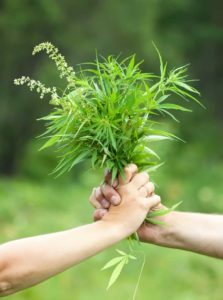 Cannabidiol is not simple Hemp-it is INDUSTRIAL Hemp-and it is a very powerful Cannabinoid, known to have a very powerful healing effect on most systems in the body. 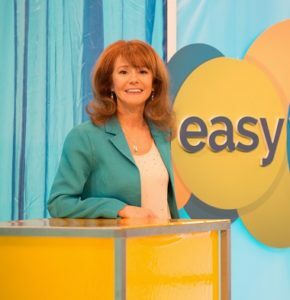 This is why I am so proud and grateful to bring a product like Easy Herb Power to market. We use the highest grade CBD available on the marketplace. With Easy Herb Power, I am bringing you the highest quality Full Spectrum CBD. Every drop is potent. There are no fillers-just pure, potent CBD in MCT (Organic Coconut) Oil, so you can get the best results possible. Why is the cost of Rena's Organic CBD so reasonable, if it's superior? I am doing everything I can to keep the price of Rena’s Organic CBD down because I want everyone who is suffering with pain, anxiety, inflammation or fatigue to try it. I’ve been helping people lose weight and get healthy for 30 years. The biggest blocks to weight loss and happiness are mental and physical pain and low energy. I finally found an herb that is all natural that works almost miraculously to heal these issues, and I am so excited about it! When I saw how difficult it is to get pure, authentic CBD at a reasonable price, I embarked on bringing Rena’s Organic to market to help more people get off expensive pain medicines, with all their destructive side effects, and live a pain-free, anxiety free, happier life. CBD is also known as Industrial Hemp. The problem is that it’s often confused with just plain Hemp, which has no medicinal value at all. Hemp is used as a common ingredient in food. It’s also frequently utilized to make fiber and clothing. Hemp is made from the seeds of the Hemp plant. CBD, on the other hand, is extracted from the whole plant, so it contains the medicinal components of phytochemicals, anti-oxidants, terpenes, nutrients and most importantly, Cannabinoids. In the late 1980s scientists discovered a system in the body that had been previously unknown: the Endo-Cannabinoid System. It turns out that the Endo-Cannabinoid System (ECS) has receptor cells known as CB1 and CB2, in almost every part of the body, from head to toe. Though the body does produce its own Endo-Cannabinoids, plant Cannabinoids boost the body’s ECS system and increase its receptor cells, thus enhancing internal communication between all bodily systems. CBD is by far the strongest plant Cannabinoid. How can one plant compound bring so many different benefits? When the Endo-Cannabinoid system is activated, every system in the human body functions more optimally. The dominant mechanism of the Endo Cannabinoid System is maintaining homeostasis, or inner balance. This explains why CBD users report so many varied benefits, ranging from improved sleep, feeling calmer and more relaxed, being sharper mentally, having increased productivity, feeling more sustained natural energy to experiencing dramatic pain relief. CBD’s powerful anti-inflammatory and immune boosting properties can assist so many aspects of your health. Absolutely! I understand that every body is different and reacts to ingredients differently. I want you to have the chance to try our high quality CBD at no risk. If for any reason, you don’t absolutely love the way you feel when you take Rena’s Organic 600 MG. CBD, return if for a complete refund for a full 30 days. Just call or email our friendly USA based customer support team to take advantage of our 100% money back guarantee (less shipping). What is special about Rena’s Organic®? Rena’s Organic® USA grown CBD is 100% organic and safe. Our CBD is Full Spectrum, meaning it contains all the Cannabinoids and Terpenes that give CBD its well-known medicinal benefits. As recently as thirty years ago, scientists discovered a powerful system in the human body that is responsible for maintaining all aspects of your health: the Endo-cannabinoid system (or ECS for short). The reason why the Endo-cannabinoid System is such a valuable discovery is because its receptor cells can be found throughout the human body. What does this have to do with CBD? Though the body does generate its own Cannabinoids, they have a very short half-life and are often gobbled up quickly by enzymes. When you supplement with plant Cannabinoids, your Endo-cannabinoid System and its receptor cells can fire more efficiently and balance is restored in your body. CBD (which is short for Cannabidiol) is nature’s strongest Cannabinoid. The wide array of healing benefits that CBD is known for is due to the fact that its main function is to bring homeostasis to the body—bringing each and every organ and cell back into a balanced, healthy state. CBD is being researched by doctors and the U.S. Government alike for it’s amazing potential to help people get off pain medicine. In fact, the United States government’s patent on CBD states that Cannabinoid is a Neuro-protectant and powerful anti-oxidant that easily penetrates the tissues of the central nervous system and brain. According to this patent, the anti-oxidant strength in Cannabidiol is considerably greater than that of either Vitamin E or Vitamin C.
I’m most impressed that the United States Military has been using CBD to help personnel with PTSD. Some research is indicating that people with PTSD have low levels of particular receptors in the Endo-cannabinoid System, especially those that control stress, fear and memories. It’s been reported that CBD can assist in replenishing those receptors, bringing stress relief and restoring balance. Will CBD make you “high”? No. You absolutely cannot get intoxicated or “high” using CBD. Rena’s Organic® CBD is extracted from the raw, whole, organic Industrial Hemp plant. It is not medical marijuana, though they do come from the same plant family—Cannabis. Scientific studies are consistently validating the safety of CBD. There have been no known cases of toxicity, even in high amounts. What’s in the 600 MG. CBD Tincture? Rena’s Organic® contains pure, full spectrum 600 MG. CBD in Omega-3 rich MCT oil, with a drop of pure, organic orange essential oil, in a 30 ml tincture bottle. That’s it! A full dropper of Rena’s Organic 600 MG CBD contains approximately 20 MG CBD. Listen to your body! Everyone’s dose is going to be a little different. For best results, I suggest that you take it sublingually—meaning put the CBD tincture under your tongue. Swish it around and swallow it slowly. This offers maximum absorption. I recommend that you start with just a few drops under your tongue and then increase from there. It doesn’t take much CBD to feel an effect. Most people who use 600 MG. CBD report that they feel the greatest benefit when taking a dropper-full twice a day. The benefits are cumulative, so taking the CBD daily is highly recommended. Based on scientific and medical research and on reports from CBD users, CBD has the remarkable potential to erase your pain and help your entire body feel so much better. 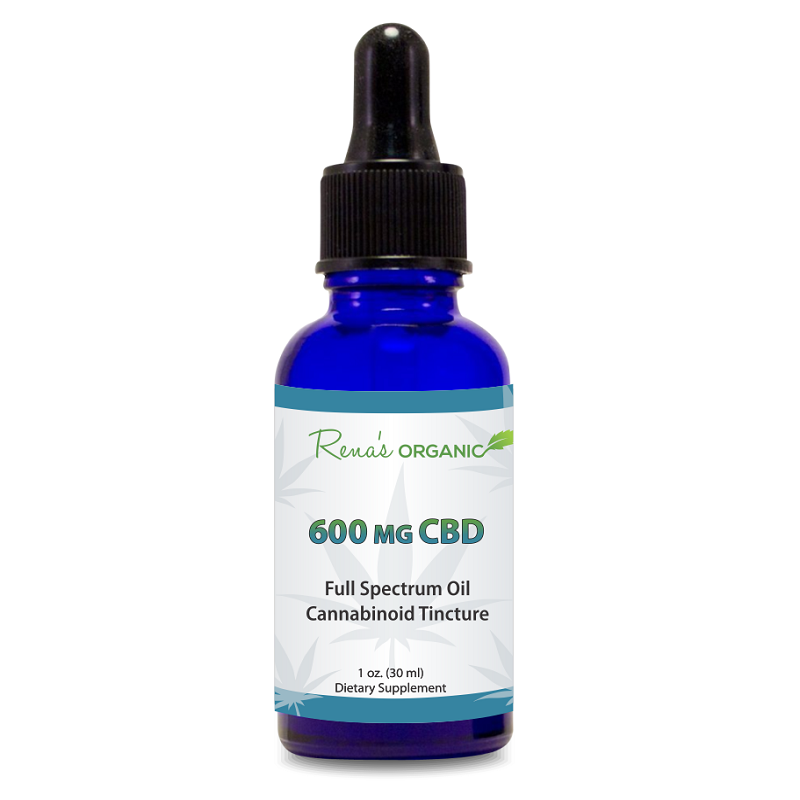 Rena’s Organic CBD 600 MG tincture is a potent and pure combination of organic, 3rd party tested CBD in omega-rich organic MCT oil (fractionated coconut oil). Just a few drops can give you incredible benefits. I have had the privilege of helping people achieve their health, weight loss and wellness goals for the last 30 years. I am honored that thousands of people attended my hospital sponsored corporate weight loss program. Hearing and seeing their results, featured on over 150 television and newspaper stories such as on CNN and Nightline, has been such a gift to me..
That’s what I love most about the Rena’s Organic® products. Not only do they contain potent, organic, full spectrum CBD of the greatest integrity, but they are completely safe and effective. The CBD we use comes from Industrial Hemp plants specially bred to have a high CBD content—organically grown, following strict farming practices. When I discovered this amazing natural pain-killer and anxiety dissolver, sleep aid, overall energizer and miraculous health enhancing compound, I wanted to share it with everyone. There’s so much garbage and hype out there, it really is infuriating to me. How can you sort through it all and know what to trust? Even health food stores and doctor’s offices often carry CBD with great packaging but only a miniscule amount of Industrial Hemp (CBD) in the product. Sometimes it’s not even medicinal CBD—only food grade, cheap Hemp, with no Cannabinoid content. That’s why I want you to have an opportunity to try real CBD at a dose that can make an absolute difference in your health and quality of life. I want you to be pain free—physically and emotionally! And that’s why I’m offering you a 100% money back 30-day guarantee. No gimmicks. 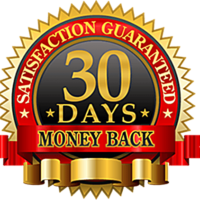 Try Rena’s Organic® 600 MG CBD for a full 30 days and if you’re not thrilled with your results, you can return it easily for a complete refund (less shipping). Just call or email our friendly United States based Customer Service to get your hassle-free refund. CBD 600 MG. is a tincture containing pure, authentic organic CBD with a high, therapeutic potency of 600 MG CBD. Get all the pain erasing and inflammation reducing benefits that CBD is known for. Easy Herb Power® 600 MG. CBD is Full Spectrum and 3rd party tested and analyzed for potency and authenticity. Our customers report better sleep, feeling more balanced and calmer with more natural energy. Contains no psychoactive component. The results have been amazing since I started taking 600 MG CBD. My pain level is so much less. I can move my shoulders and wrists so much more easily. Now I can do the needle point that I love without pain.